Spring Outfit Try-On + FF Link-Up! Happy Wednesday friends! I mentioned in my last post that we have had so much rain up here the last few days so it made it pretty impossible to get blog pictures in. I thought it would be fun to share with you some really cute purchases for spring! Honestly, so many of these items are from Abercrombie. If you had told me a year ago that Abercrombie would be one of my go-to stores to shop I would be pretty shocked but WOW. They have so many good items! I LOVE their basic tops and tanks but more than anything I am just obsessed with their jeans--especially this light-wash pair. Happy Monday friends! I hope you guys had a great Easter weekend. We went to the Cape to visit family and even though it rained almost the whole time we were there, it was so nice and relaxing + great to spring time with family! 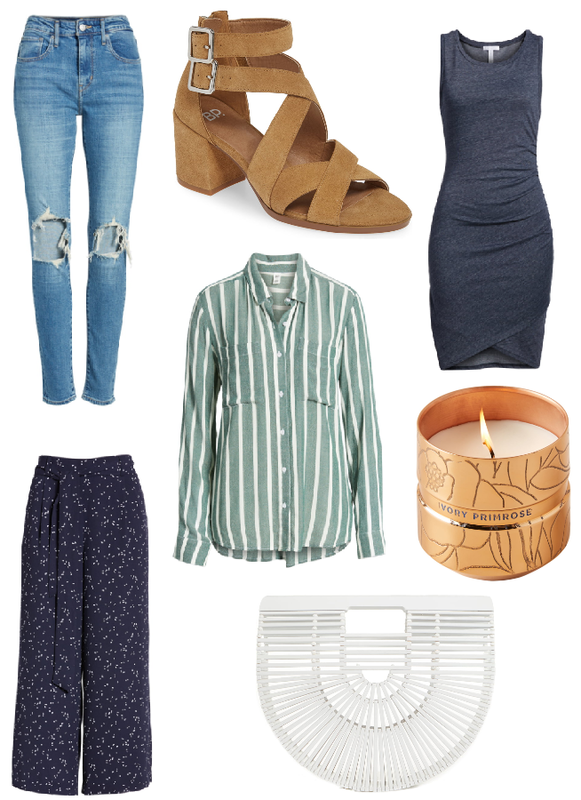 I always love shopping any of Nordstrom's sales and right now there are so many great pieces included in the spring sale. I have these distressed Levi's and they are SO good guys. Definitely in my top 3 favorite pairs of jeans! Also--this bodycon dress that everyone raves about really is as good as they say. It's flattering on all body-types, comfortable to wear and super versatile! One thing that I don't have but definitely will be scooping up before the sale ends today is this Cult Gaia bag. A ton of their items are on sale and I am obsessed with every single one of their bags--especially for spring/summer!